Preheat oven to 375°F. Spray muffin tin with cooking spray. Brown beef in a skillet and season with salt and pepper. Drain. Cut wonton wrappers into circle shapes, about 2 1/4-inches wide, using a biscuit cutter or the top of a drinking glass. You can cut several at a time. Tip: For a more rustic look, leave wonton wrappers uncut. 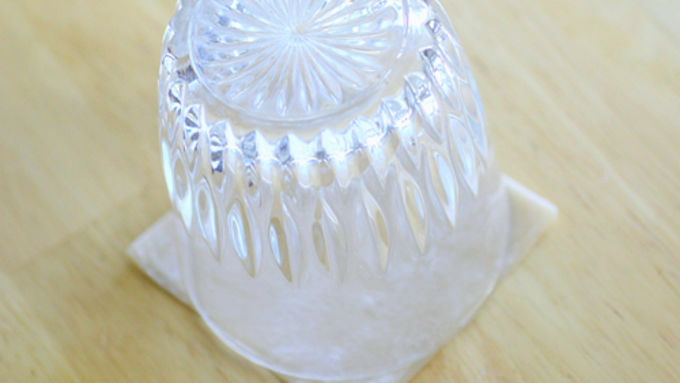 Reserve 3/4 cup Parmesan cheese and 3/4 cup mozzarella cheese for the top of your cupcakes. Start layering your lasagna cupcakes. Begin with a wonton wrapper and press it into the bottom of each muffin tin cup. Sprinkle a little Parmesan cheese, ricotta cheese, and mozzarella cheese in each. top with a little meat and pasta sauce. Repeat layers (wonton, Parmesan, ricotta, mozzarella, and pasta sauce). 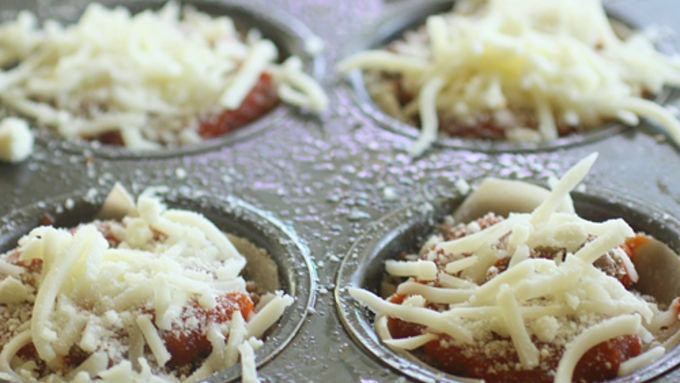 Top each cupcake with some of the reserved Parmesan and mozzarella cheeses. Bake for 18-20 minutes or until edges are brown. Remove from oven and let cool for 5 minutes. To remove, use a knife to loosen the edges, then pop each lasagna cupcake out. Garnish with basil and serve. 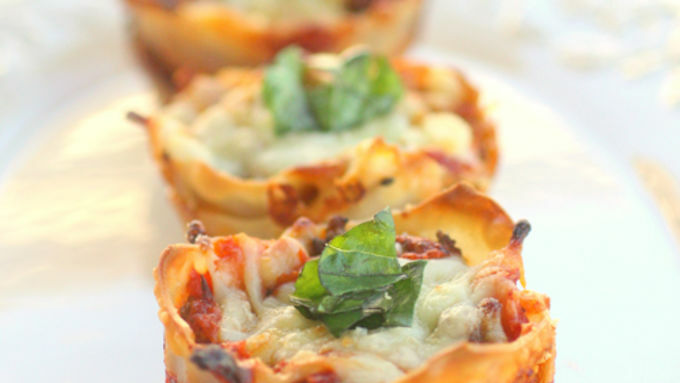 These lasagna cupcakes are easily made using all of the same ingredients in your classic lasagna with layers of meat, three types of cheese, and wonton wrappers instead of pasta. Usually lasagna looks like a big gooey mess, but when it's in cupcake form it looks elegant and refined. Wonton wrappers are used as the pasta element in this lasagna, eliminating the nightmare and logistics of trying to make pasta noodles cupcake sized. 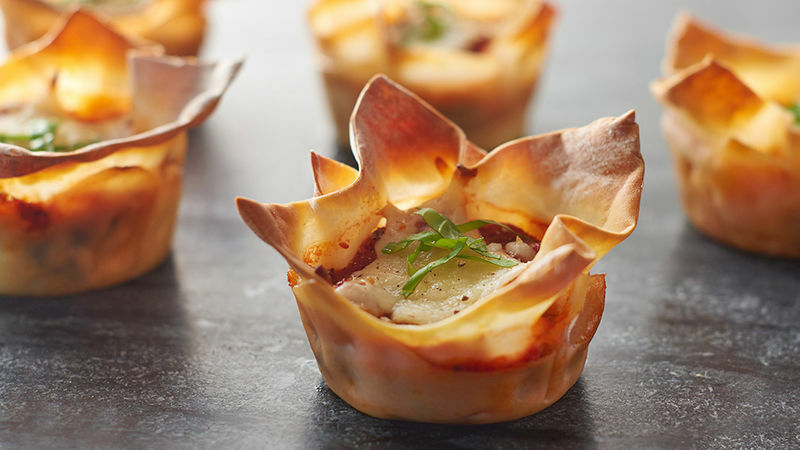 Wonton wrappers are fresh little sheets of pasta that are perfectly sized for these lasagna cupcakes and because of their thinness they cook up super fast. Just take a stack of wonton wrappers and place a drinking glass on top. Using a knife, cut around following the edge of the glass to make circle shapes. If your family fights over the corners of the lasagna pan because of the crispy and chewy corner pieces, with these cupcakes every single lasagna cupcake has the yummy texture of those corner pieces.